Despite the country’s still under the world football governing body, FIFA’s suspension, Sierra Leone has moved a place up in the global rankings, which was published on Thursday, February 7 2019. Having endured a double drop in the monthly classification in November and December, the national team, Leone Stars moved from 115th position to 114th on the global stage. On the continental rating, the country stays 29th position. 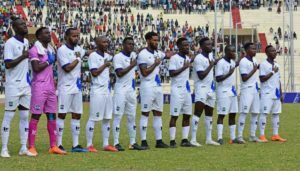 Sierra Leone last played an international match when the team suffered a 0 a 1-0 defeat away to Ethiopia during their second 2019 qualifiers before facing disqualification by CAF. In Africa ranking, the Teranga Lions of Senegal are leading the pecking order, followed by Tunisia, Morocco, Nigeria, Congo DR, Ghana, Cameroon, Egypt, Burkina Faso and Mali in the top ten. In a related development, Asian Cup champions Qatar have made giant strides in the rankings. Their maiden title has seen them gain 38 places to move up to 55th place in the update.